In the news today we often hear stories about indigenous communities setting up blockades to protest government policies and to protect their lands, rights, and traditions. In reading statements these communities issue to the public, we can see that they’re standing on the edge of an abyss: expected to remain silent while corporations (with the governments full consent) destroy everything they hold sacred and everything that makes them unique. In turn, the People say they have no choice but to try and stop it–and indeed they don’t, because their inaction would mean accepting a death brought on by men who sleep a little too well at night. That said, we’re halfway through 200, and so far this year, we’ve seen more than 5 dozen protests, roadblocks and countless lawsuits brought forward in defense of Indigneous lands and rights. The number will continue to rise as long as the federal and provincial governments refuse to uphold their legal mandate by engaging in meaningful consultations with Indigenous People – and in so doing, respecting their right to say no, and their right to live in peace with their cultures, lands and traditions intact. Lurking behind these efforts, so far away that most people can’t see it, let alone make sense of it: there is a massive health crisis in Canada. According to a Treasury Board of Canada Inventory on contaminated sites, amidst all these protests and roadblocks, there are 4,464 toxic sites within the treaty territories of Indigenous People. By the looks of things, Canada is doing next to nothing to clean these sites. And, sadly, there is next to no one reporting that fact. No articles are being written in the paper, next to no studies or investigations are being carried out, and even fewer resources are available to those who are suffering or in danger as a result of exposure to the toxins. There are, however, a small handful of legal efforts aimed at those responsible for the sites, directly or indirectly. For example: the Beaver Lake Cree, the Woodland Cree and the Chipewyan Prairie Dene First Nationa are all suing the Alberta government because of the impact that oilsands development is having on their treaty rights, their lands and their health. Several communities have issued moratoriums on industrial activity for the same reasons. Examples include the People of Kitchenuhumaykoosib Inninuwug, Grassy Narrows, Takla Lake, Serpent River, as well as the Dehcho, Chipewyan, and Tahltan. There are also a few – but only a few – community efforts that monitor the levels of toxins. Currently, the Aamjiwnaang Bucket Brigade is the only example I can find. Where are these toxins coming from? Noting the fact that there are numerous contamination sites not mentioned in the Treasury Board Inventory (see below), are you wondering where all these toxic sites are coming from? 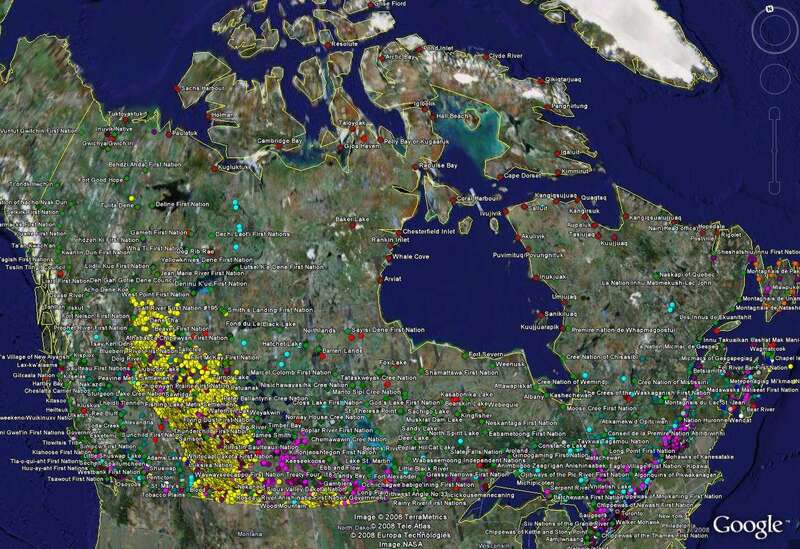 What you see here is a google map put together by the National Pollutant Release Inventory (NPRI) – Canada’s legislated, nation-wide inventory of pollutants released, disposed of and recycled by industrial facilities. The map lists over 8,600 facilities in Canada, who together released, etc. more than 300 different chemical substances in 2006. NPRI Facilities. In viewing this map, please remember that it’s two years old. It therefore under-represents the current number of facilities in Canada, especially those pertaining to oil and mining. Indigenous Communities. This map was created by Canada’s Department of Indian Affairs, so it only includes communities “recognized” by Canada. The Lubicon Cree for instance, are not listed on the map. Primary mining sites such as tailings ponds, landfills, slurry injection sites, and so on. Government-funded housing: There is a major problem with Black Mould and Asbestos in the government-funded housing on treaty lands. There’s one last set of sites not mentioned in the database… According to a 2005 Report by the Assembly of First Nations (pdf), all of Canada’s 22 nuclear reactors are situated on Indigenous Treaty Lands. The Nuclear waste is stored on-site. Oil Spill in Attawapiskat community still not cleaned up – children threatened. Environmental pollution and diabetes may be linked (it is estimated that 27% of Indigenous People in Canada will have Type 2 diabetes within the next 20 years. If you have any thoughts or information that can improve or further this brief, please add your comments below.